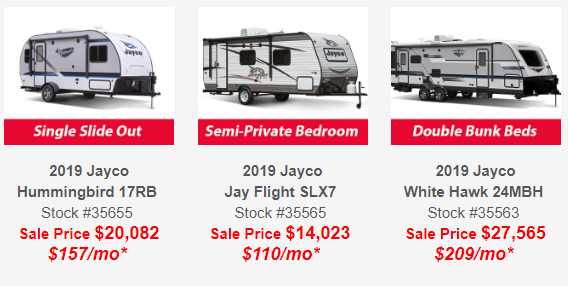 Jayco Sales Event: July 11th-14th! Don’t miss out on the 1st Inaugural Jayco Days Sales Event from Wednesday, July 11th through Saturday, July 14th! We are celebrating this special Jayco Sales Event at our RV Dealership in Bath, NY for one weekend only. Join us for a special BBQ chicken lunch, live music, free giveaways, door prizes and more on Saturday, July 14th. It’s an RV party! 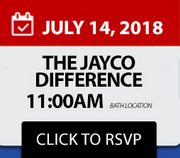 Make sure and RSVP to attend the Jayco RV Seminar at 11:00 on July 14th. You will learn about the unmatched engineering practices, product features, industry-leading warranty, craftmanship, famiily friendly floorplans, sustainability and ecoadvantage of the various RV products Jayco has to offer. We will have factory representatives on hand to answer all your questions about Jayco features, construction, their industry leading 2 year warranty and more. Financing as low as 4.99% o.a.c. 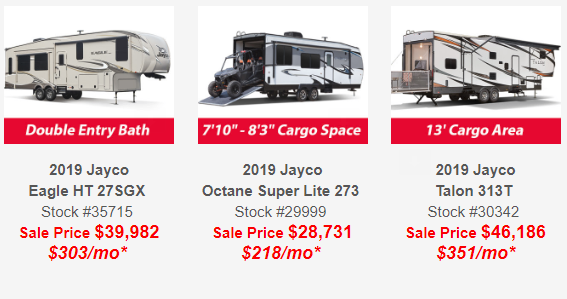 Check out just a few of the fantastic Jayco sales deals we have to offer! Come for the deals, stay for the fun! Wilkins RV in Bath is the place to be on Saturday, July 14th for free family friendly fun. Mark your calendars so you don’t miss out on the delicious chicken BBQ lunch and rockin’ live music by the Devon Franks Band. The kickoff starts at noon! This is your chance to get an amazing deal on the Jayco RV you’ve always wanted. For 50 years, RVers have relied on Jayco’s quality construction and dependability. See the Jayco difference for yourself this July 11th-14th at our Jayco Days Sales Event!